Heard the name before? of course yes! No, I am not talking about our teleserial hero Shaktiman that we watched for a week in our childhood (I watched it for a week before shutting it off forever). I am talking about the horse shaktiman. The same horse who was injured due to an M.P's illogical and crazy action of hurting or beating him out of protest of something. How can you beat an animal for no fault of his or her? 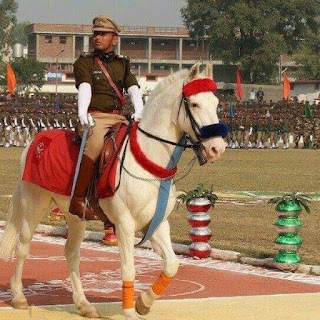 Shaktiman was a 14 year young horse dude who was employed in mounted police. If you have seen his pictures in the media, you can well imagine how strong he was. See this pic below. But because he was a disciplined horse in the police unit, he kept his cool even when his leg was getting broken. Of course, media did some good thing by highlighting it and help poured in from all quarters including a prosthetic leg from abroad. But I had predicted it that he would not survive long enough as a horse is dependent on his body that nature has given it to him. Take it away and he is as good as dead. Being an average horse rider myself from one and half years, I have come to recognize some horses and their traits. Shaktiman was a fighter. He survived for 1 month or more before eventually giving it up.